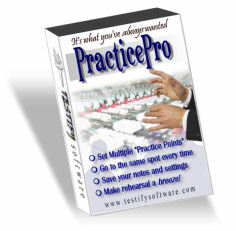 PracticePro was designed to be the perfect rehearsal tool for individuals, groups, or choirs. No more struggling to run the CD back to the spot you want. With the (optional) remote, you don't even have to go back to the machine! PracticePro will make rehearsal a breeze! Return to the exact spot you need every time!